If you’re thinking about opening a Virtual Reality Arcade you’ve found the spot. We’re constantly creating resources that are designed to help you succeed in the space. Our arcade management software is second to none and offers a ton of useful features. Our favorite is how we help keep the industry above board by making sure game developers are getting paid. As you can imagine, they like it too. This blog is another great resource…or at least it will be. We’ll be focused on two things: sweet VR experiences and helping you grow your business. Give us a little follow here or on Twitter so you know when all the fresh content is being served up. The absolute best resource we can provide you is the knowledge we’ve gained as both the first AND the largest VR Arcade Management company in the United States. We want to provide you with white glove treatment so you’re ready to operate your new VR Arcade fast. Business Description: We provide you the equipment, training, management software and access to gaming to run your own branded VR experience for your customers. This gives your guests another reason to come in while adding cutting edge appeal to your organization. Even better is our ability to “brand” the hardware and software with your logo. Soon we be placing your chosen advertising inside the goggles interstitially during the gaming experience. Talk about a captive audience. Quick Background: We began in early 2016 building software designed to help manage Virtual Reality arcades. As the software gained popularity, relationships with VR game developers blossomed. We opened one of the first VR Arcades in the country, “VR Junkies” in June 2016. As that location grew so did interest in other arcades being opened. We have seven as of 5/11/2017 and will have at least than many more by January 1, 2018 through our franchise opportunity. The private label VR side of our company makes the arcade about you and your brand. We created a simple and effective way to catapult your venue to the cutting edge of out of home entertainment and technology while dramatically increasing your bottom line. Products & Services: Right now we can get you setup to operate your customized VR experience. Soon we will be releasing online scheduling capability that ties into your CRM, a mobile app that enables push notification to offer specials, and in-screen advertising that reaches a truly captive audience. All of these services will have tremendous impact on your bottom line. 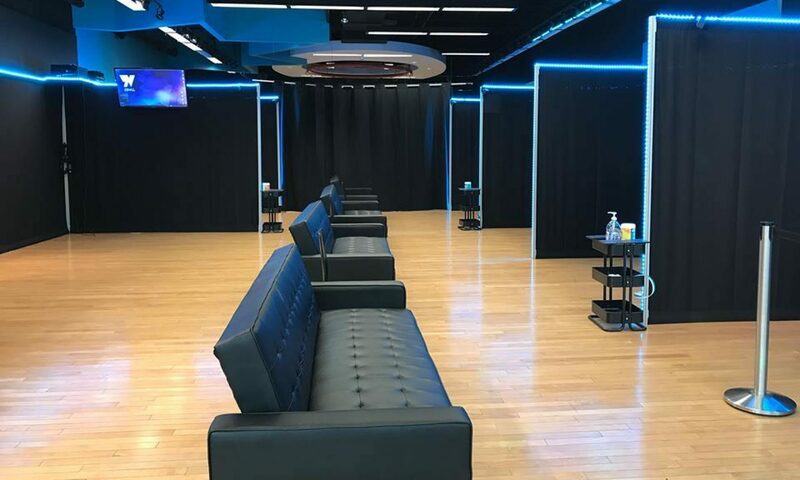 What it looks like: The Private Label VR experience requires a minimum of 100 square feet per (10×10). Watching people play in a VR world is almost as exciting as playing; at least one of these booths should be in a high traffic area. We’re happy to help you with the space planning, computer configurations and onsite installation of your arcade booths. A booth includes the goggles, sensors, hardware and software to run it, and a monitor (so people can see what the player sees). As the technology is so new, most people haven’t experienced it. Their first time in, will likely require a staffer to show them “the ropes”. Once started, the play is very intuitive and will require little (if any) further assistance. How to engage with us: We have two levels of service we provide: The first is a guided “do it yourself” where we make sure your in house “tech” gets everything operating correctly. The “white glove” option includes us doing the configuration and installation of equipment. With either scenario, we will provide training on both operations and customer experience. Our custom built game management software (detailed in our presentation) gives you data points on your customers, the games they play, how long they play them and the amount of minutes played. If you are interested in learning more, e-mail me or pick up the phone and call 248.224.1326. It’s fitting that this is our first post as it is effectively my “getting” into VR story. There’s a lot of links to some really cool videos in here and my hope is you’ll know more about VR than you did or at least that you will enjoy the time spent on in our world. This blog post appeared first in a different form on my personal blog on 4/20/2016. I’ve had a great time coaching and consulting with several individuals and companies over the years. I’ve had an even better time being on stages in front of these same folks delivering messages of inspiration, motivation and strategies for growth. In all of these scenarios I’ve helped people recognize opportunities when they see them. When it comes to industries with yuuuuge growth potential, few come close to Virtual and Augmented Reality ($30B and $150B respectively by 2021). When a door opened in November, 2016 to get into the space, I popped my head in. As I learned more about it, I found myself wanting to learn more about it. What I found was potential that is only limited by one’s imagination and budget. If you’re interested in a fairly quick, get you up-to-speed primer, check out this great video on the history and almost present of VR (the video was made in 2015 before the REALLY BIG changes). On the off chance you didn’t watch the video (and even if you did) allow me to share some of my favorite VR applications. Training and Learning: these are huge opportunities and what I really love is how your brain doesn’t know the difference between reality and virtual reality. What that means is that for dangerous and repetitive tasks vr simulations will soon be the only way to train. This VR training being done in the oil rig industry right now is a shining example. Real Estate: you have a buyer who wants to see a dozen homes on a Saturday? What used to take all day and was filled with disappointment, can be accomplished in under an hour. It’s really cool what’s being done in this space. Look at this Virtual Tour developed with Matterport and Google Earth. Working with soldiers who suffer from PTSD: it’s been said that war is basically 98% waiting for stuff to happen and 2% WTF just happened. It’s that 2% that leaves mental scars because people who go through it have a hard time properly processing that experience. And when these memories come up, they are so painful that the only act is to repress them. We know that is not the way to work through an issue. VR allows soldiers to go back through these scenes in their life and talk about exactly what they were experiencing. It’s amazing. Tourism: This is big. So big. Why? Because as travel gets more expensive it cuts down the number of people who can experience these destinations in person. With VR, you can be anywhere you want to be and your brain won’t know the difference. Check out this cool VR Experience in Hamilton Island, Australia (you can control what direction you look by using your mouse or finger) We are definitely looking to work in this space. Gaming: Gaming is the gateway to everything above. It’s also where our company is cutting our teeth. We have built Arcade Management Software to help Virtual Reality Arcades run more efficiently. We can learn a lot more about that at our website. As of 4/20/17 I’m working on getting Family Entertainment Centers setup with this amazing new attraction. We’re working with bowling alleys, laser tag facilities, jump zones, movie theaters, traditional arcades and more in the “Out of Home Entertainment” space. It’s been a blast. Mostly because these places are all about fun. You know who likes fun??? This guy!!! Last month our team went to Transworld, the largest Haunt and Halloween expo on the planet. Why? Because we’ve got a killer haunted VR experience. It’s going to be in quite a few places October. Maybe you’ll get to check one out. Be sure to look at our Facebook Page for some entertaining videos. I’m also working with a large cruise line to bring this experience to their guests and ports they travel. The one area that I didn’t mention earlier is medical. That’s one space I continue to explore and try to find the right “in” for. It’s one of the most promising areas and smart Doctors are already using VR for training, diagnosis and collaboration. It’s big time. Take a look at this medical training happening in VR. Have you tried VR? Either the phone kind or the real kind with an HTC Vive or an Oculus Rift? If yes, what did you think of it. If no, when will you? Are you interested in keeping up with VR? If so, check out our Facebook Page where we share ALL kinds of updates about the industry. Thanks for taking a look at this. I’m looking forward to connecting with you soon.